Behavior charts! Behavior charts are a great way to motivate kids when working on problem behaviors, keeping track of chores or following a daily routine. 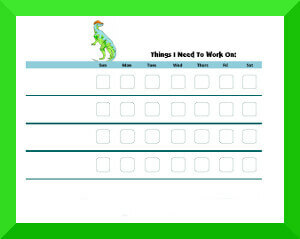 If your kids love dinosaurs, they will have a load of fun with our dinosaur behavior charts. It's a great idea to involve your kids when picking out a chart and chart marker..crayons, markers or stickers. So have fun with your child and eliminate problem behaviors too!